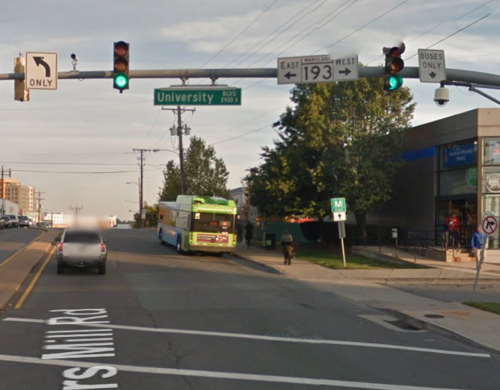 just up the pike: what if montgomery county gave BRT a temporary test run? what if montgomery county gave BRT a temporary test run? Last week, Montgomery County pulled its proposal for building bus rapid transit, citing community opposition. How can the county win people over? By getting something on the ground now and doing a trial run. 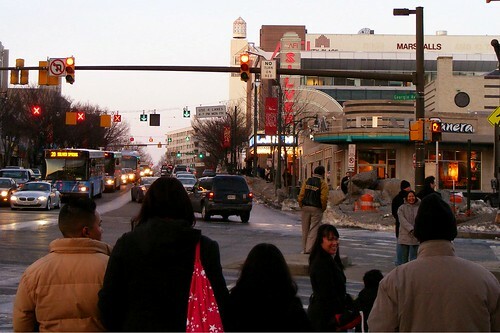 How can we get streets like Colesville Road better transit sooner rather than later? Photo by the author. After several years of discussion, the county approved a plan for a network of dedicated bus lanes in 2013 with strong support from residents, business leaders, and transit advocates. Soon after, County Executive Ike Leggett proposed creating an Independent Transit Authority that could build and operate transit in the county and raise taxes on its own to pay for it. Today, the department of transportation runs transit service, using money from the county's budget, which the County Council sets each year. Leggett's proposal drew an unlikely coalition of opponents, from civic organizations who were against BRT in the first place to groups worried about government spending. Meanwhile, initial designs for BRT on corridors like Georgia Avenue proposed unnecessarily massive road widenings that would have removed dozens of homes and businesses, which naturally angered many residents. Do county leaders still want BRT? Now in his third term as county executive, Ike Leggett has alluded to transit as part of his legacy. He's said that the 100,000 jobs slated to come to places like White Flint and White Oak depend on better transit. Bus Rapid Transit lines on Route 355, Route 29, and Veirs Mill Road are among the county's top transportation priorities. But the county seems to be backing away from BRT. The Georgia Avenue line got shelved. And Leggett already pulled his ITA proposal earlier this year. Ike Leggett says he wants to do a public outreach campaign for BRT to build support for a transit authority. But it may not be enough to convince skeptical residents. They need to see something tangible. Metroway in Alexandria. Photo by Dan Malouff. We could send people to Alexandria to ride the Metroway BRT line. It's already carrying 20% more riders than anticipated. It serves the new neighborhood of Potomac Yard that looks like what Montgomery County wants to create in White Flint or White Oak. Or we could start bringing BRT in some form to Montgomery County today in trial form, so people can see how it can improve their daily lives. 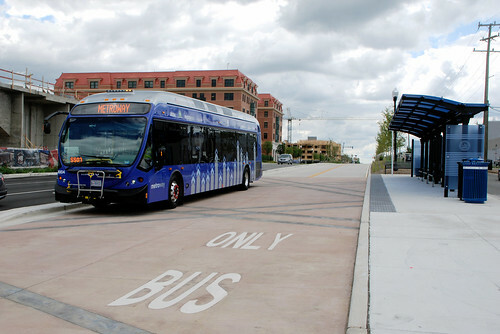 Bus Rapid Transit consists of several different parts that make buses faster, more reliable, and more comfortable, like a train: machines where you pay before getting on; larger, covered stations; longer distances between stops; and of course, dedicated lanes. The county's vision for BRT, as in many other places, involves doing all of those things at once. It's more effective, but also more expensive. We're already implementing some of those things now, like limited-stop bus service or off-board fare machines. The thing that has the biggest impact, but is also the most controversial, are bus lanes. And that's what people need to see in action. A very basic bus lane on Veirs Mill Road in Wheaton. It's maybe a mile long. Photo from Google Street View. Local political consultant Adam Pagnucco has suggested that the county build a BRT line on Veirs Mill Road to prove that it works, but it would still take a few years and a lot of money. In the meantime, we could do a trial: for a few months, simply reserve the curbside lane of a major street for buses, using paint and some police enforcement to keep drivers out. Drivers and transit riders alike could see how it would affect their travels. The catch is we'd have to do this in a place with high transit use, like Veirs Mill Road, Route 29, and Route 355, the three BRT corridors the county's studying. These streets are congested now, but they're also where most transit riders are, and would get the most benefit from dedicated lanes. Doing a trial would be hard and require a lot of political will. But it's ultimately easier than convincing the public to make a huge investment on something they haven't seen before. And it allows us to see what works and what doesn't work, so we can make needed tweaks early on. Most importantly, a trial gives Montgomery County transit riders a better trip now, rather than far in the future. They can't afford to wait, and neither can we. Dan, where did you hear that the County is backing away from BRT? I hadn't heard that. Anything short of a light rail system is a total waste of money. Bummer. I'm VP of an HOA board in White Oak... was hoping for the BRT.